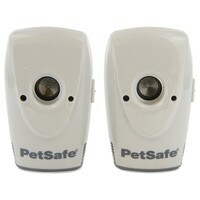 The Petsafe Indoor Bark Control Units creates an indoor bark free zone without the need for a collar. When the unit is within range of a barking dog, an internal microphone will pick up the sound. The unit will then begin to automatically emit an ultrasonic tone that can be heard acutely by dogs. This should startle the dog and stop them barking. In time, your dog will begin to associate its bark with an unpleasant noise and stop them barking indoors altogether. When the dog stops barking, the ultrasonic tone will also stop. Freestanding, or can attach to doors, windows, tables etc. This is a seriously good idea - painless and harmless to the dog, and it stopped our spaniel constantly having a 'barky party' within about 5 days. We've kept it going for the last three weeks to get him really used to the idea that barking in the house is a no-no. I'm so glad we got this product... It really works!